As you all probably know, a terrible storm came through Omaha yesterday, Friday, June 28th, and did some pretty incredible damage to the city. Our neighborhood is filled with century old trees and was pretty hard hit. Fortunately, everyone we know as well as us are okay. 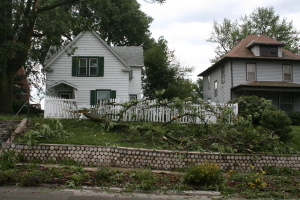 Our fence has seen better days, but looking at the picture below, we are very lucky that branch did not hit our house. When the storm came, my dad and I were in the house. After living here through numerous tornadoes, the 80’s blizzards, the 90’s ice storm, I have never seen a storm quite like this. Apparently, the average wind speed was over 70 miles an hour at the worst point with gusts much faster. Enormous trees have been uprooted all throughout Omaha. As the wind whipped the rain horizontally, we could see all types of debris flying around. Entire windows were blown out of one of our neighbor’s houses and the screens were found a block down. We spent all yesterday evening cleaning up the neighborhood as well as all afternoon today. There were tons of heroes though, like Mark below, who went around the neighborhood with his chain saw and four-wheeler, chopping up and dragging away the worst offenders of fallen trees. Our house is still without power with the power lines hanging in shreds behind it. Our, *cough*, not so wealthy neighborhood has not even seen a single OPPD (power company) truck all day so it might be a while before I can fully contact everyone. I would like to thank Caffeine Dreams, however, for being the one coffee shop in this part of the city that 1) is open, 2) has electricity, 3) and has internet. As soon as I am back up and running next week, I will post all the photos I took after the storm. Time to go see how many of the artists at the annual art fair survived the weather. Whoa, you called me “gay” for making goat-cheese grilled cheese sandwiches with an olive tapenade and fresh basil, but you use the word “tempest” in a headline?